My grandmother passed away just this past Thursday, June 14th, 2012. She and I were quite close, and she was a wonderful human being that always made you feel welcome when you came to visit, and her face and voice positively lit up when she greeted you. I was lucky to have been one of her granchildren that lived quite close to her growing up, and as my mom was the oldest of her children, we spent quite a bit of time at her home. There were always beautiful flowers blooming – from peonies to poppies, so many colours; crabapple trees that we would climb and challenge our cousins to take a bite from the tart fruit; and the garden! Peas straight from the vine, and carrots from the warm soil. There was always something baking, or about to baked, or hot from the oven. You could never leave hungry, and were often sent home with some type of goody wrapped in foil. There was always so much love in her home. Grandma adored her family, and her husband. When my grandfather passed away after a short battle with cancer in 1991, Grandma was at a loss for a bit, but then quickly rallied as she always did, and set out on her new life alone. She earned her first driver’s license later that year, at the young age of 70. I was lucky enough to spend some time with her the week before she passed. We sat for a while, and I held her hand. we talked a bit, and I fed her ice cream one day, her fish at lunchtime another day. I am so amazed that at age 91 that she was able to recount the story of how her four year old granddaughter walked across Red Deer thirty-three years before (yes, that was me); and then I heard for the first time in my life, the story of how she met Grandpa. Her obituary is below; it is hard to sum up her life in a few black and white sentences when she was such a dynamic force in our lives. We will miss her greatly in our family. 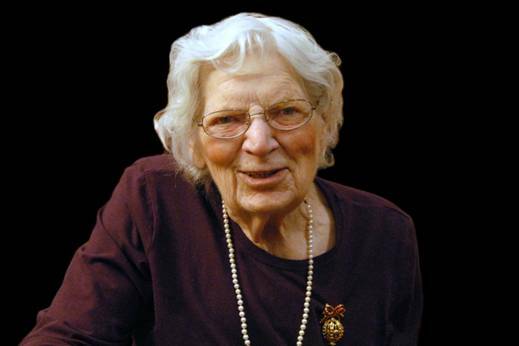 It is with great sadness we announce the passing of Margaret Myrtle (Mitchell) Gudim on June 14, 2012 at the Sunset Manor in Innisfail, Alberta. Margaret was born Dec 24, 1920 in Monitor, Alberta. She was the youngest daughter of John and Jane Mitchell. She had six older siblings – Bill, Mary, Ethel, Jackie, Olive and Violet. She married Walter Gudim in 1942 and they moved their family to Rimbey in 1946 and later to Red Deer in 1963. They eventually had six children Carol (Art) Pratt of Rocky Mountain House, Terry Abrams and John Kendall of Calgary, Rosemary (Colin) Dent of Queensland, Australia, Robert (Heather) Gudim of Strathmore, Fae (Allan) Roberts of Calgary and Bruce (Diana) Gudim of Calgary. Their family grew to include 18 grandchildren and 22 great grandchildren. Margaret’s family and friends were very important to her and much treasured. Her beloved husband Walter predeceased her in 1991. Funeral services will be held from the Church of Jesus Christ of Latter Day Saints, 3002-47 Ave, Red Deer on Saturday, June 23, 2012 at 12pm. Final resting place will be in Alto Rest Memorial Gardens Cemetery. If friends desire, in lieu of flowers, donations may be made to the Heart and Stroke Foundation, #202 – 5913-50 Ave, Red Deer.